Solenoids are typically DC magnetic fields and rotational symmetric geometry, and are thus well suited to our CAE software MAGNETO for magnetic analysis. For cases with significant non-rotational symmetric effects, AMPERES should be used instead as simulation software. If there are significant transient effects (e.g. due to motion of the plunger), then the simulation software to use are OERSTED (2D) and FARADAY (3D). To model electric problems (e.g. potential for breakdown around the coils), then the simulation software to use are ELECTRO (2D) and COULOMB (3D). 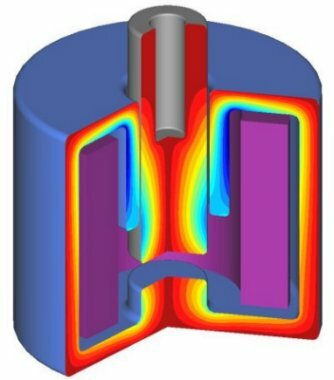 For thermal simulation (e.g. finding hot spots), then the programs to use are KELVIN (2D/RS) and CELSIUS (3D).